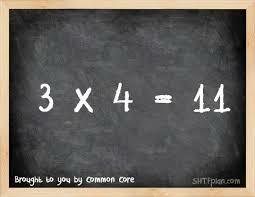 Missouri Education Watchdog: Common Core "Rigor" Nonsense Talking Points. Blah blah blah blah blah. Common Core "Rigor" Nonsense Talking Points. Blah blah blah blah blah. This is the definition of Common Core rigor. Rigor is a popular education buzzword – especially right now with the implementation of Common Core standards. Politicians, corporate leaders, and educators at all levels have echoed some version of President Obama’s words from 2009: “It is time to expect more from our students.” Rigor is a key element of CCSS, and as students head back to school over the next few weeks, it’s being discussed in classrooms all over the country. But what is rigor? Is it higher expectations for achievement? Is it harder questions and more homework? No. But when many people think of rigor, they’re falling prey to some false beliefs about what rigor means in the classroom. •Students must do more work. Oftentimes “more work,” including increased homework, really means low-level activities and repetition. •Students need to solve problems independently. Learning to figure out a problem is important, but that doesn’t mean the teacher shouldn’t offer support and help guide students in the right direction. • Rigor is just one more thing to do. Many educators view adding rigor to their instruction as an entirely separate undertaking. The good news about these definitions is that rigor is not something extra you need to do, nor is it something that needs to be so rigid or difficult that children (and teachers) suffer. So what are some truths about rigor? • Rigor means more challenging work instead of just “more work.” Each student learns differently, but incorporating elements of differentiated instruction will challenge students at a level that’s comfortable for them. • Rigor means supporting students. Rigor happens somewhere between fully independent learning and spoon-feeding answers. Forming student groups and offering help builds a classroom atmosphere where students feel safe asking questions. Teachers can accept high-level responses or ask more probing and extended critical thinking questions: “Have you considered . . .?” “Why did you assume that?” It doesn't matter if 3 x 4 = 11. Just explain your answer and you will get credit: even if it's wrong. • Rigor means incorporating critical thinking strategies. When you incorporate critical thinking strategies into your classroom (e.g., scaffolding thinking, assessing thinking, group discussion), you’re automatically encouraging rigor. You’re engaging students, and moving them beyond basic recall tasks into higher-level thinking. If you’re incorporating critical thinking strategies into your lesson plans, you’re already providing rigorous instruction. Engaging students, challenging them, and creating an environment that encourages curiosity and questions will provide students with skills like inquisitiveness, determination, and creative thinking – all skills they need to be lifelong learners. With all due respect, this is PR nonsense. The rigor you speak will leave students behind international peers in math by 2 years BY 8TH GRADE according to the lead validator, Dr. James Milgram. He was the only mathematician on the validation committee and refused to sign off on them because they are "substandard" standards. Maybe you'd like to visit this blog and leave your comments on rigor, Bill Gates and Common Core?